This is Lulancy,sales manager of the Good Fuith Precise(HK)Mould Industry CO.,LTD. wanna to explore the possibility of cooperation with worldwide buyer. Good Fuith Precise(HK)Mould Industry CO.,LTD is a professional ISO9001:2000 certified plastic injection mould maker and moulder with more than ten years experience. We specialize in the design and manufacture of injection moulds and precision moulding/production of plastic parts. We have state-of-art mould-making machinery, plastic injection moulding machines and over 500 skilled and dedicated workers.Every year,over 80% of our moulds are exported to the United States and Europe for production. In addition to using steel P20 from China, we stock steel from Thyssen (Germany) and P20, H13, S7, and 420SS from Assab (Sweden), etc. We choose steel depending on customers' requirements and longevity of moulds. We use standard components from China, DME, and HASCO. Moreover, we use hot-runner molds from YUDO, DME, INCOE, etc. If there is any project where we can assist you, please don't hesitate to contact us, you will get the best service you can ever get. 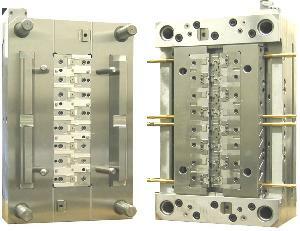 Your attention to Good Fuith Precise(HK)Mould Industry CO.,LTD will be highly appreciated. Add: Wusha Industrial Zone, Changan Town, Dongguan City, Guangdong Province, China.